Second Life is a virtual world of endless possibilities, with many useful tools as means to add a touch of reality to unachievable dreams and aspirations. This pixel life opens doors which can help many to find hope and confidence to become more successful in the flesh existence we know as real life. We all have at one time or another been possessed by the deep desire for the glamorous lifestyle lived by those who we perceive to have it all, those such as the glamorous designers as Karl Largerfeld, Domenico Dolce, Stefano Gabbana, Frida Giannini and Marc Jacobs. It takes hard work, creativity, and a true passion for fabulous designs to achieve success as a fashion designer, but you can break into this career much more quickly and easily with the amazing package up for grabs in Second Life’s answer to the hit show “Project Runway”. 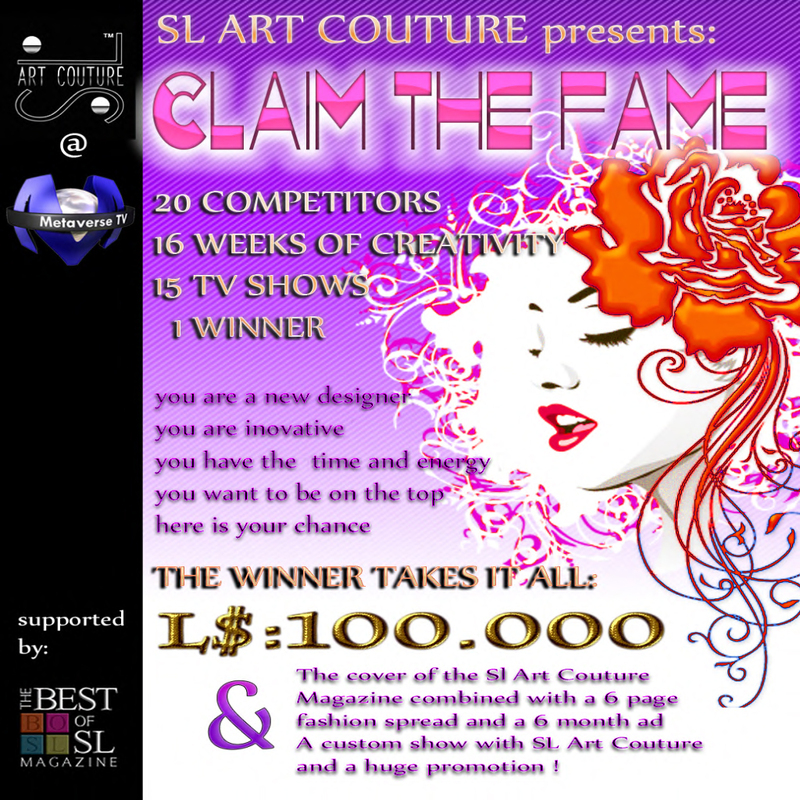 SL Art Couture in association with Metaverse TV and supported by BOSL Magazine have come up with this truly amazing project called “Claim the Fame”. It offers new aspiring designers and those who have not yet found recognition within the virtual marketplace, the chance at becoming a well known and respected brand. The winner of this contest will expect to enjoy not ONLY 100,000 L$ cash, not only both the front cover and 6 page fashion spread of an issue with SL Art Couture Kult Magazine, not only a 6 monthly advertisement campaign in the SL Art Couture Magazine, not only a custom made fashion show with custom built catwalk and top fashion models with the SL Art Couture production team, but also a huge promotional campaign, advice and support from some well known and respected members of the fashion industry within Second Life. To take part in this amazing adventure on offer, applicants need to submit an application and attend a casting, broadcasted also in Metaverse TV. From these castings 20 lucky contestants will be carefully selected to participate with the ambition to “Claim to Fame” of aspiring to Second Life’s next top designer. There will be in total 15 live televised shows every wednesday over a 16 weeks period of creative bliss as the lucky competitor’s work their magic aiming to make through each round and to claim the winning place, of which there is only one spot. Will that be you who claims the fame? Founded by Arisia Ashmoot, CEO of Body Talking, Tatanka Kaligawa, Owner & Designer of MEA CULPA and Wicca Merlin, CCO of MEA CULPA, SL Art Couture is a fresh and dynamic company with the ability to fulfill your wildest dreams in the fashion world. The purpose of this company is to bring in new elements and shine a light on the fashion industry by adding the artistic element to events, taking them to a whole new level. Formed by a team of experienced professionals, designers, builders and models, we aim to bring you absolutely the best experience possible. Our team also provides you with specialized services for other events you may wish to hold so please check the “SERVICES” tab to see what we have to offer. For pricing on our services, pricing on ad space in KULT Magazine or to book what you need, please contact SWEETEST SANDS. Also, be sure to join our group on moolto.com. Thank you! This entry was posted in Events & Contests, Fashion and tagged 15 shows, 16 weeks, 20 Competitors, casting, Claim the Fame, contest, Designer Contest, Metaverse TV, Press Release, Show, SL-Art Couture. Bookmark the permalink. ← News at Mea Culpa!